It was 4:00 in the morning and I couldn’t sleep as I anxiously thought about what I should wear. Is it going to rain? Should I bring an umbrella? 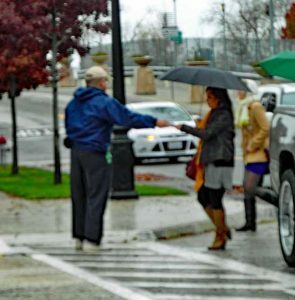 If I bring an umbrella, how am I going to hold it and a placard, and hand out fliers at the same time? Maybe I should just stay home. But I knew that wasn’t an option; my conscience would bother me too much if I didn’t go. 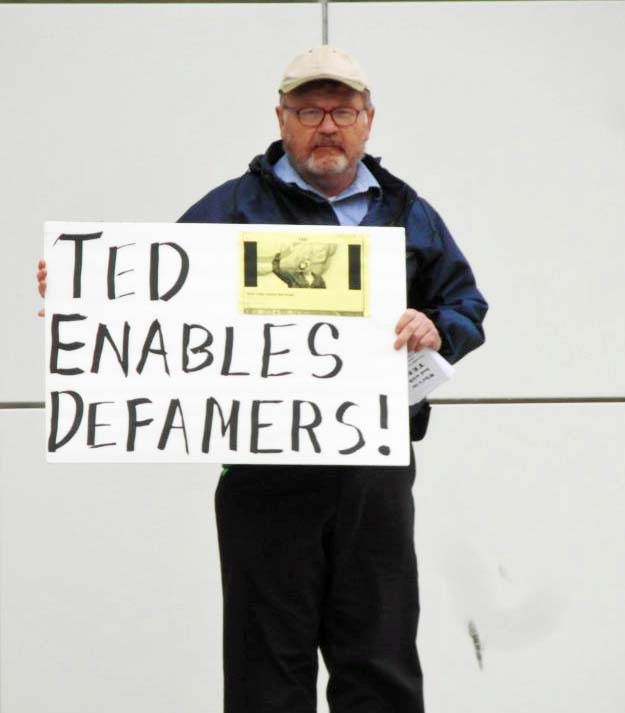 Even if I only got a picture of myself holding up my “TED Enables Defamers” sign in front of the Crocker Art Museum in Sacramento, it would be worth it. Besides, some people had already heard I was planning to be there to protest a TED event at twelve noon on December, 12, 2014, so I needed to show up. Since I couldn’t sleep, I got up and worked on some signs and fliers. After my son woke up, I talked him into going to Sacramento with his sixty-year-old rabble-rouser dad, so that he could be my driver, photographer and bodyguard. We loaded up the car and, although the sun was out, I grabbed a rain jacket. Soon we were cruising past walnut orchards and the welcome sight of over-flowing creeks and ditches, hopefully a sign that California’s long drought might be coming to an end. 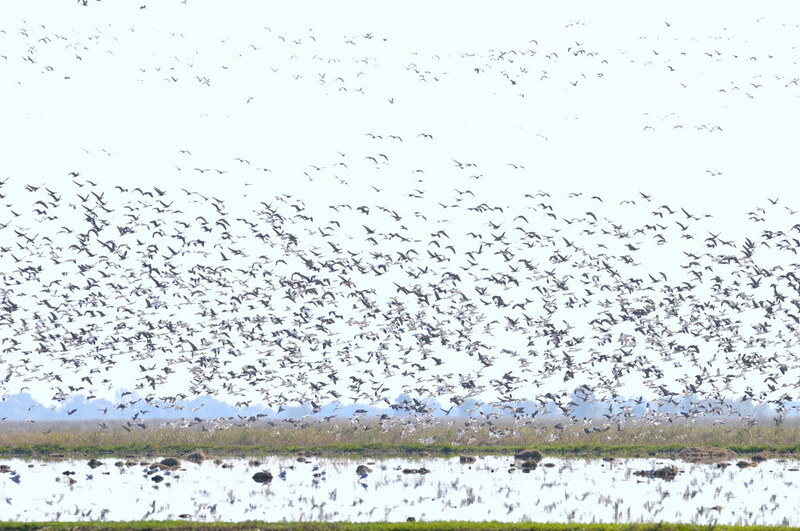 As we drove between some rice fields I watched in awe as copious flocks of waterfowl flew near us and landed nearby. I then rolled the car window down a short way and listened to the music of ducks, geese, swans and other birds as I closed my eyes and took some deep breaths of the rain-washed air to calm my nervous spirit. Before long my son was practicing his big-city driving in downtown Sacramento. After some difficulty, he soon had the car parked. I grabbed my four signs, to give to any others who might join me in my protest, and we walked a couple of blocks to the museum entrance. I held my “TED Enables Defamers” sign under the words “Crocker Art Museum” as my son took a photograph. However, he missed the words “Crocker Art Museum” and someday maybe I’ll return for a reshoot. 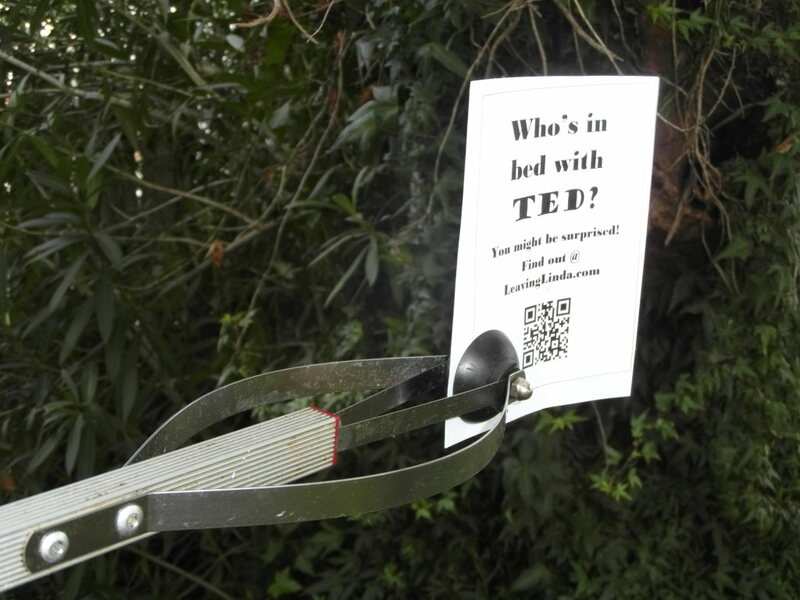 “Who’s in bed with TED? You might be surprised! Find out @ LeavingLinda.com”. Thanks to a suggestion from my son, I had added a QR code (all by myself, I might add), that linked to my recent blog post which details some of the history of forced thought-reform and questions why TED would support such sordid activities. In a short while, as expected, museum security was telling me I couldn’t be there and that I needed a permit to protest. I informed them that it was my constitutional right and they would need to have me arrested if they wanted me to stop. I then threw my car keys to my son and told him to make sure he took lots of video if the cops came. The security guards, a lady and young man, then left me and went back inside. Sadly, it appeared no one else would be joining me in my protest and it was going to be a one-man show, so I decided to put down my placard with the other ones I had made and focused on giving out my fliers. I simply welcomed people to TED and handed them a piece of paper. I guess everybody must have thought I was with TED because nearly everyone took one. People were even asking me what entrance they should go into and I was happy to direct them. However, before long, Mr. Head Security Guy was telling me to get off the museum property and forced me into the street, which wasn’t all that bad, although I did have to loudly explain to passers-by that I was banned from the sidewalk and that if they wanted to know why, they should come over and get a flier from me. That seemed to work, because most people took the extra effort to get a flier. (A few times I did disobey my orders and quickly jumped over to the sidewalk, handed out a few fliers then hopped back into the street.) But if there’s a next time, I’m just going to ask my ninety-year-old dad if could borrow his picker-upper thing which he uses to pick up stuff from the floor without bending down. That way I could extend my reach from the street all the way to the sidewalk and keep everyone happy. “Where does she teach?” the guard asked. Run for your lives! 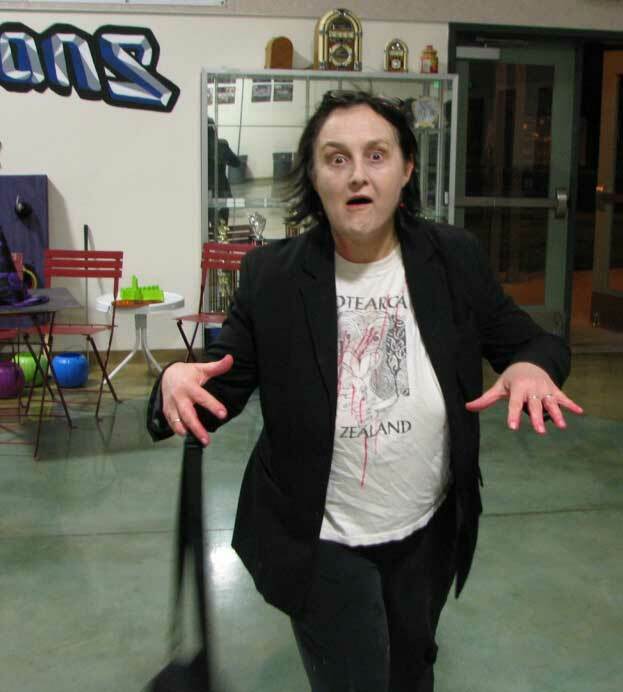 Zombie piano teacher! “In a small town about fifty minutes north of here,” I responded. It started to rain softly and I was glad I brought my rain jacket. More people walked by and I continued to joyfully welcome them to TED and hand them a flier. At 1:00pm I had ten fliers left of the original stack of 139 (I had given one to a curious Staples clerk). I wished the friendly security guard a good day and walked away, jumped in the car and soon we were heading home. I quickly checked my blog when we arrived home. Fifty visits to “Who’s in bed with TED?” between the time I left home and came back, which was about three hours. Not bad, I thought, and I’ll probably get even more visits later. Little did I know, another very special moment of validation was yet to come. 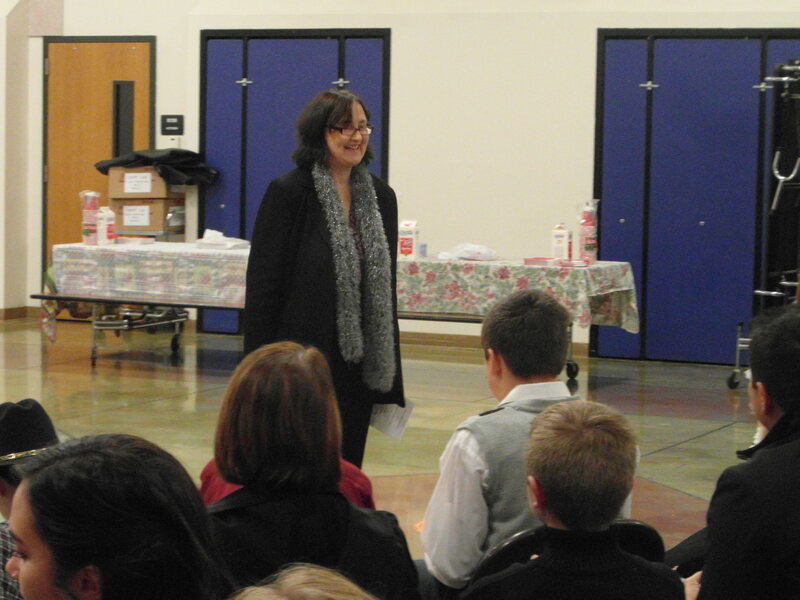 The next day, my wife and I attended a Christmas concert by the Sacramento Choral Society and Orchestra. I don’t often go to such things, but as mentioned elsewhere in this blog, I’m attempting to acquire a little more culture, besides the “agri” kind. So there I was, traveling to the big city again, this time with a car-pool of friends from Grace Episcopal Church. 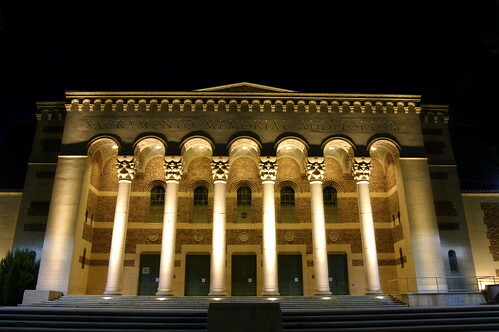 The five of us, having left our vehicle in a downtown parking garage, were walking toward the Memorial Auditorium, where the concert was to take place. As we drew closer, the muffled sound of a megaphone pierced the night air. When we rounded a corner we saw police cars, flashing red lights and a large group of people chanting loudly and holding placards that read “Black Lives Matter!” All of this was being closely watched by a small army of uniformed police officers. What we were witnessing turned out to be a protest and “Die In” against the recent shooting of unarmed teenager Michael Brown in Ferguson, Missouri. The protest was taking place right outside our concert venue. The atmosphere was tense, as a long line of concert-goers snaked into a side entrance, while a much shorter line filed toward the front of the Auditorium, right past the protesters. I encouraged our party to head over the lawn and to the short line in front. Soon, there we were, standing a few feet from the noisy crowd. Close by, a young African-American man held his arms high while shouting, “Hands up! Don’t shoot!” It was the security guard, now in street clothes, that had been keeping an eye on me while I was at the Crocker Art Museum! We recognized each other instantly. Infecting students with the joy of music. He then took a short step and gave me a bear hug. And there we were: a graying red-headed, brain-infected white guy and a young African-American male, embracing as shouts for justice rang out from the crowd and echoed off the Memorial Auditorium walls. I felt like…..like God was giving me a warm hug. And all of a sudden, the restlessness and loneliness of the previous day washed away, like the fading quack of a lone mallard as it flies desperately to join the flock. Thank you for the encouragement. Whenever I get discouraged and want to give up on “spreadin’ the word..” I think back to the week, many years ago, when my mother was on her deathbed, and my wife was kidnapped and I didn’t know where she was. My mother passed away the same day Maree was rescued from her kidnappers. I’s my hope that no one will have to go through that same anguish I did. Thanks Walter. Yes, one person can do something. If you want any tips for protesting a TED event in San Diego let me know.